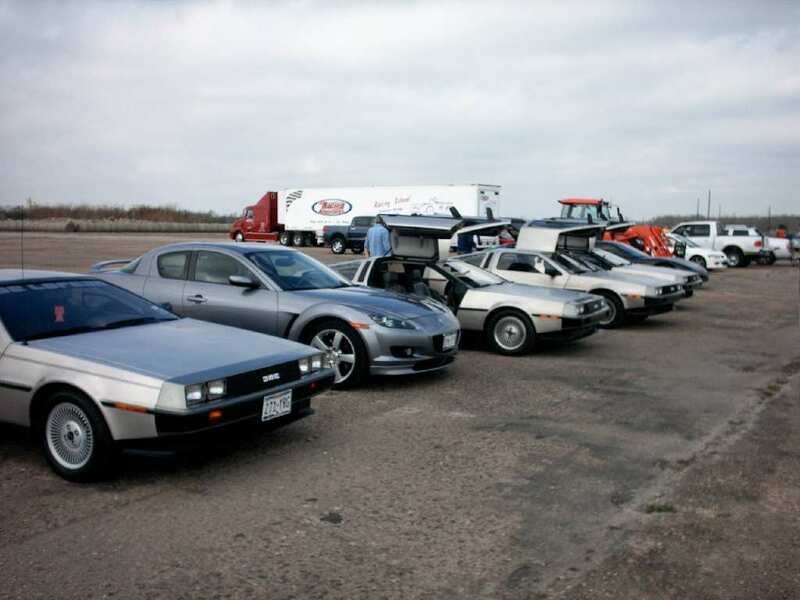 We were lured by an invitation of free track time at the new GrandSport Speedway south of Houston. So in-between karts and motorcycles, we were allowed on the track with a few Corvettes and other cars. We held our own, although all of us were held back by a pace car the entire time we were on the track. Attending were: Ali Bharwani, Bill Ballard, Bill Swilley, Thomas Kidd. 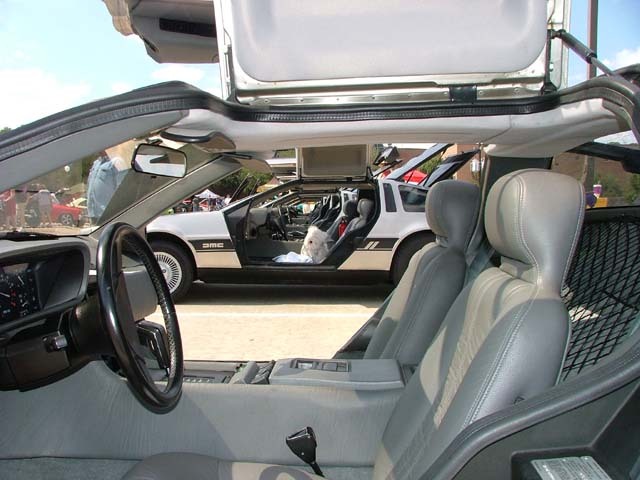 #1, A view from the dashboard of the number 4 DeLorean (Kidd), on the track. #2, Taking care of business, in-between track time. #4, Even the motorcycle group had the pace car to deal with. 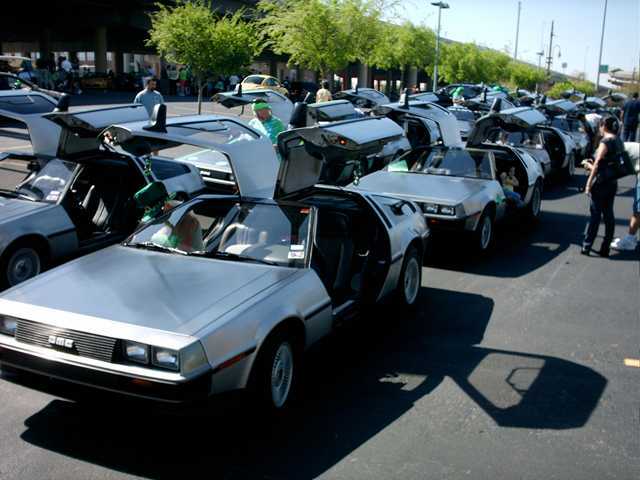 Fourteen DeLoreans participated in the parade this year in downtown Houston, and set a world-wide record (so far un-challenged) for local DeLorean club participation in a St. Patrick's Day event. This blows the gull-wing doors off the Ohio club record participation of 13 in 2007. This is also a local club record for participation for any type of event. A big "Thank You" to everyone who attended! See the attendee list in the parade positions below. #1, Before the parade, getting ready in the staging area . 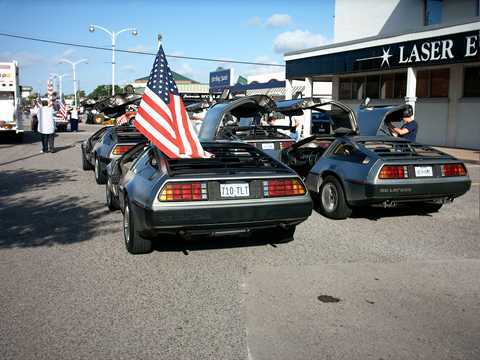 #2, Front view of cars awaiting the start of the parade. 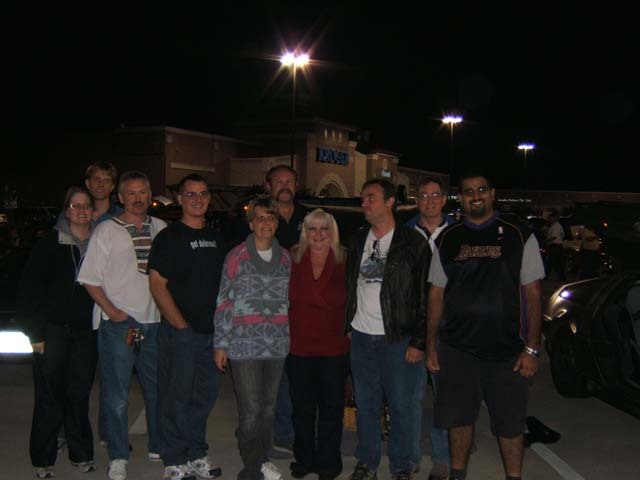 #3, Group shot (will try to identify individuals later). 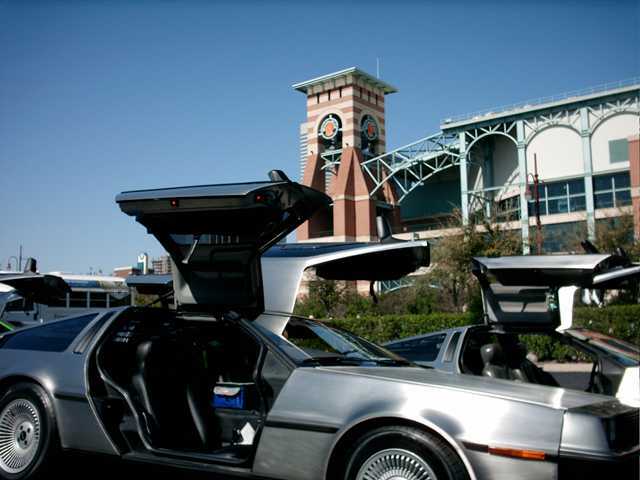 #4, A DeLorean, under the clock tower at Minute-Maid Park in downtown Houston. Look at that blue sky. It was a beautiful day, albeit a little warm. 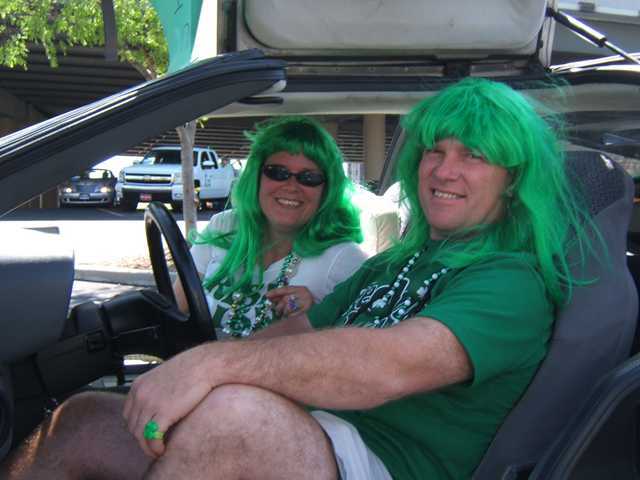 #5, Dwayne and Mary Jane obviously have the luck-o'-the-Irish. Either that, or they hit the pub a bit early. #6, More gull-wings than a flock of seagulls. 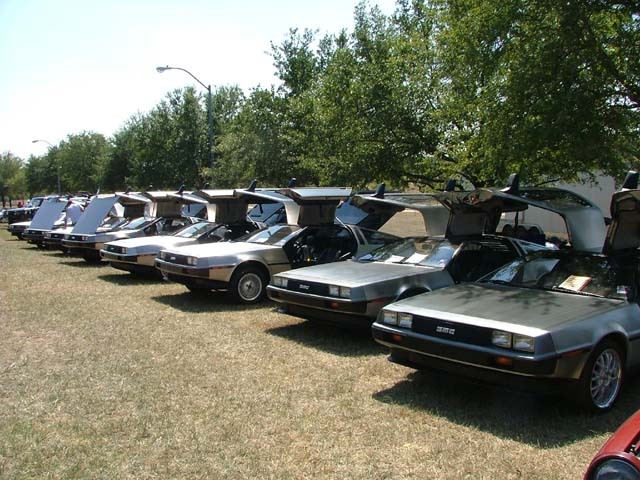 #7, As this was a record for DeLorean participation, it's hard to see all forteen cars. #8, James O'Espey, and his two little lepricons enjoyed the parade. 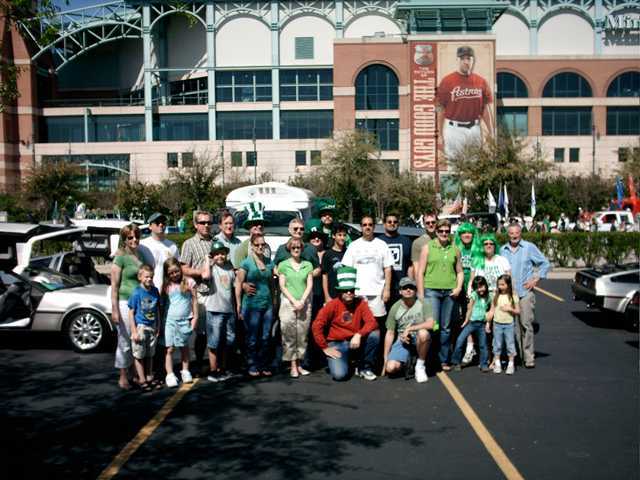 (Comments by Ali Bharwani) The morning started with James, Brandon, and myself meeting up at DMC-H so that we could drive down to Minute Maid Park. 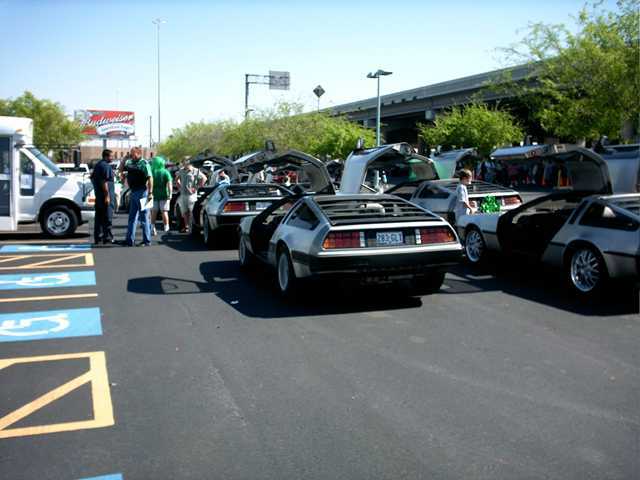 As always three DeLoreans driving down the freeway caught lots of eyes. We entered the car show at approximately 9:45 where we meet up with Bill Swilley. 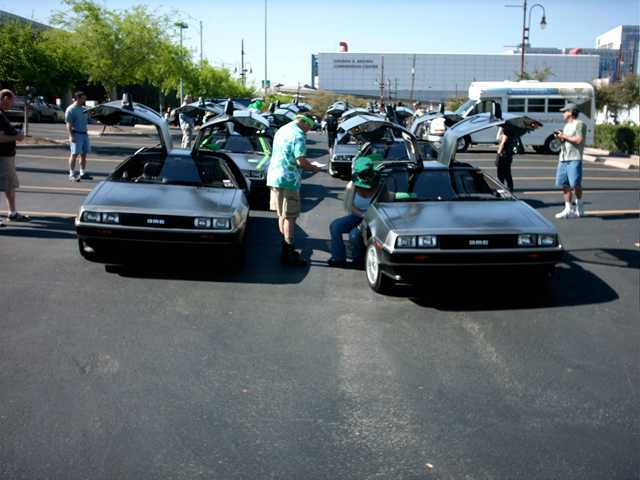 The first thirty minutes or so were spent helping fellow group members clean their cars so that the Deloreans could be presented with the utmost beauty. 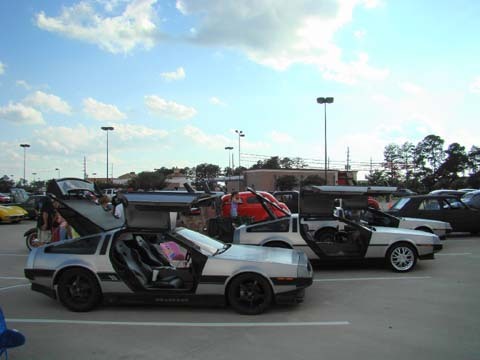 The car show had a great turnout of cars and people and we also had the revalation of possibly adding air bags to a Delorean's suspension :) just kidding. 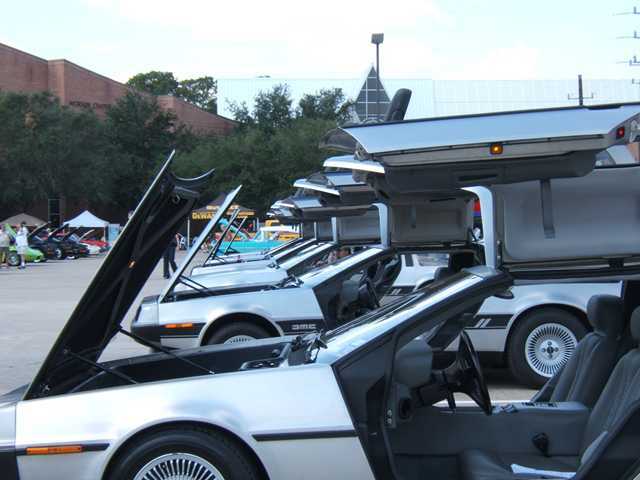 The show ended at about 12:30 PM and the only thing that was really missing was more Deloreans. 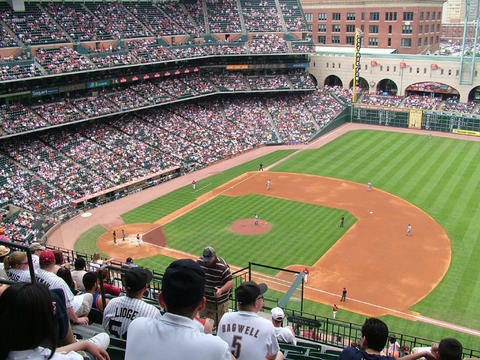 Fortunately I recieved an email from my contacts at the Houston Astros and they said that the show was successful and that they will be holding another one next year. (For the people that attended, the Astros did send me a suggestion form for things that they could do better next year, so if anyone has any suggestions I would be happy to forward them for you). After the Show we went to the game which was a lot of fun (though it was a warm day)! For some, it was a first time experience going to a baseball game so I hope every one had fun. I am researching more activities for the group to participate in, so if anyone has any ideas I'm all ears. 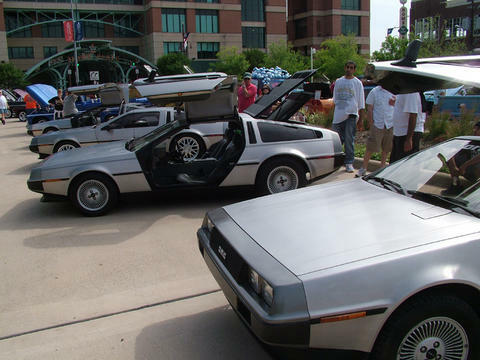 #2, The car show parking was outside of Minute Maid Park (formerly Enron Field), adjacent to the George R. Brown convetion center. 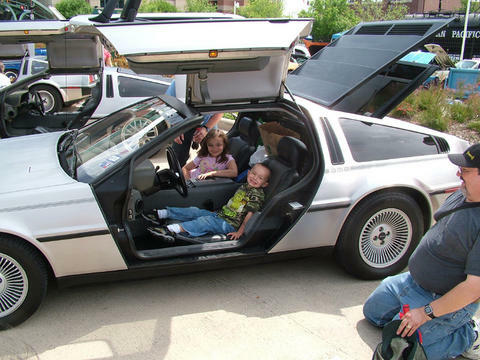 #3, DeLoreans are always a car show favorite for kiddos. #4, Yes, there actually was a baseball game going on that day, not just a car show! The Astros beat the Rockies 6-4. 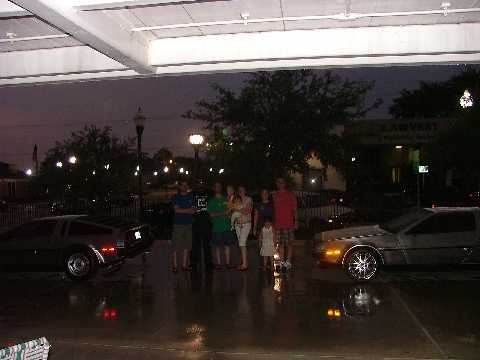 Three DeLoreans (Mims, Owen, Streckfuss) attended this leisurely Saturday evening street meet. Pictures are compliments of Photobucket. #1, All three cars, (left to right) Owen, Mims, Streckfuss. 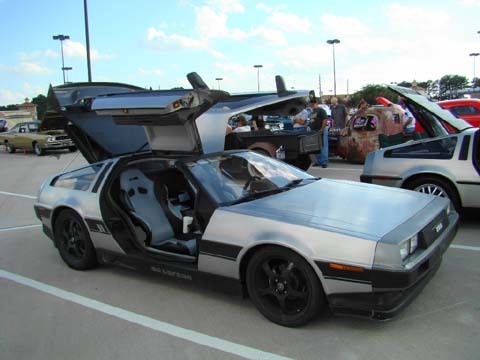 #2, Heath and Antje Owens' modified/Heathenized DeLorean. 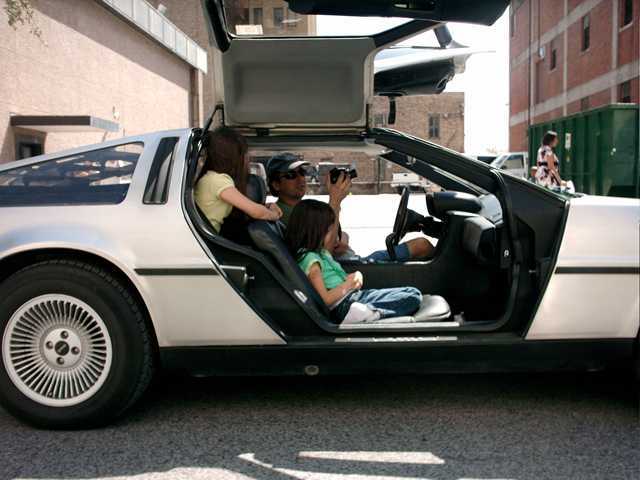 (Additional useless comments from the web guy: We understand that this is actually Heath's car, because Antje has her own, unmodified DeLorean, although not present at this event. #3, Jay Streckfuss' car. Was that a mouse I just saw in there? 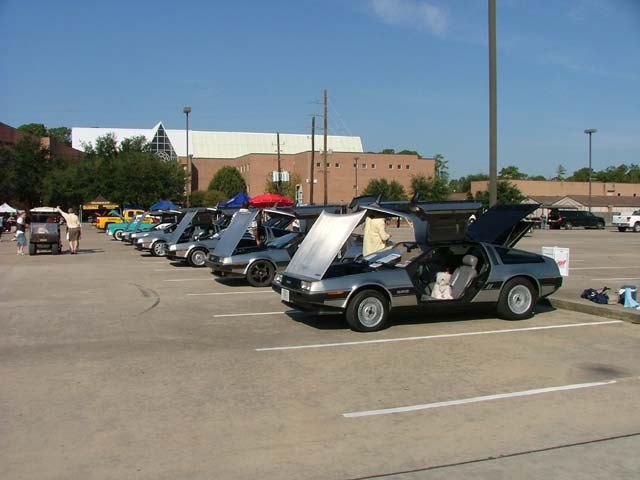 Seven DeLoreans participated (Ballard, Birdwell, Dartt, Kidd, Mims, Owen-2 cars). It was a warm morning, starting at the Bellaire Triangle. We finished the parade before noon, so we went for a burger afterwards. #1, In the preparation area, before the parade. (Comments by Brandon Mims) There were about 60 people there. It had rained that afternoon and drizzled for about the first 30 minutes of the movie. After that it cleared up and was pleasant. 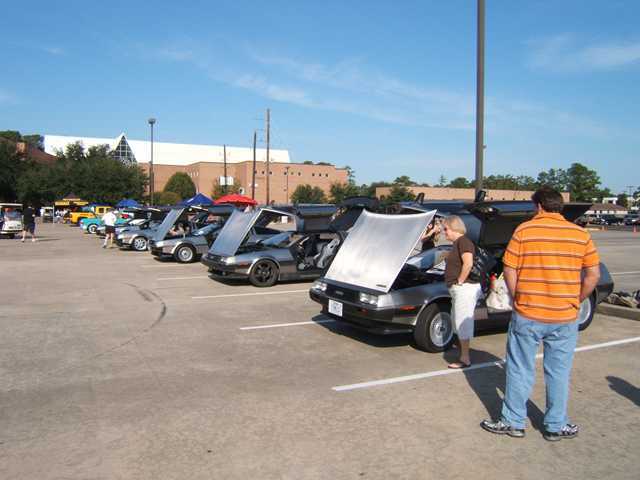 People liked having the cars of course and the organizer thanked us many times. Might be a annual deal. 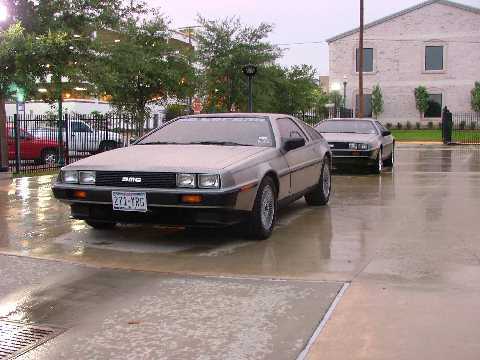 Two DeLoreans participated (Mims, Bharwani). (Comments by the organizer) I just wanted to send you an email thanking you for coming out with your Dolereans to the Movie in the Park despite the weather. The Dolereans really added to the event, I cannot tell you the number of times I heard someone say 'look, these are the cars from the movie'. 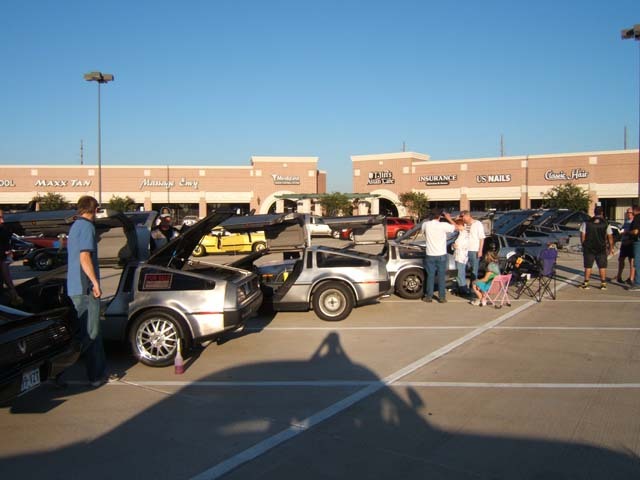 #1&2, The DeLoreans arrived 30 minutes before the movie, which started after dark, as this was an outdoor screening of BTTF. #3, As usual, we try to get a group shot. 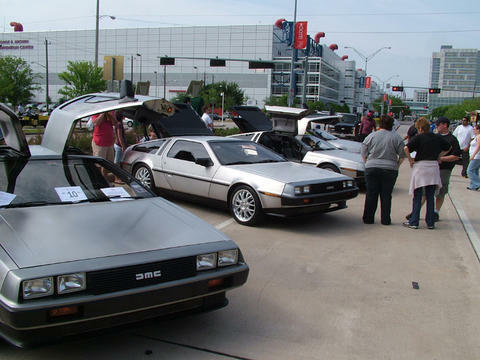 This is an annual two day event on Saturday and Sunday in September, in Round Rock, Texas. Saturday afternoon, there was a road rallye followed by a dinner. The show itself was on Sunday. There were eight cars in all, with some from Austin (Antje and Heath Owen), Dallas (Dismukes), and Houston (Ballard, Mims, Swilley). 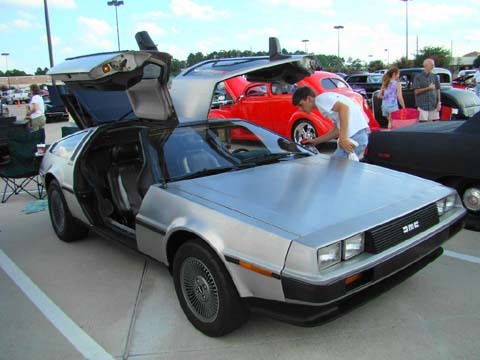 #1, A lone DeLorean owner makes final preparations to his car for the show. #2, Antje's stock car and Heath's modifed car. Can you tell which is which? #3, Ballard's car, with "The Transporter" in the background. 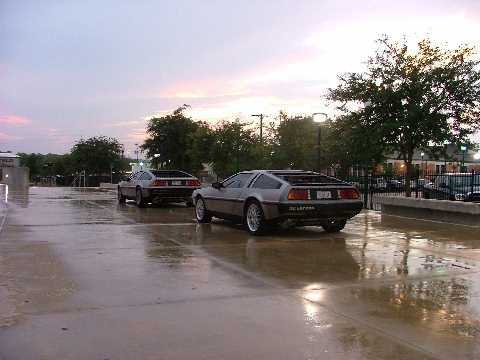 #4, A line up of DeLoreans on turf and among trees always makes a nice photo. 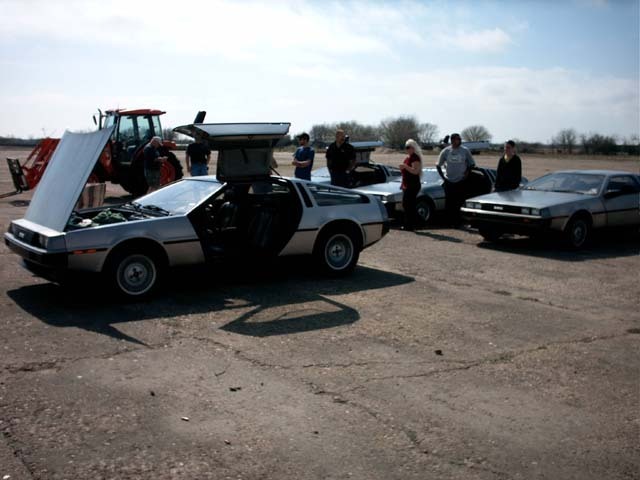 Seven DeLoreans participated (Malbec, Bharwani, Birdwell, Dartt, Mims, Heath and Antje Owen). #1, Spectators approach with caution, as these cars are radioactive, you know. #2, Ahhhh, the ol' through-the-doors picture. 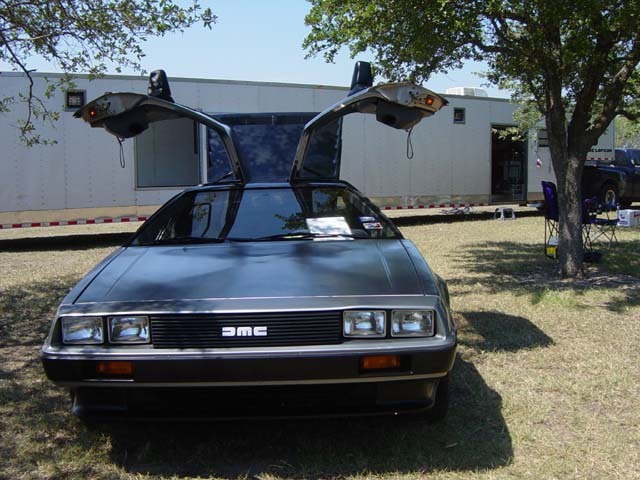 No DeLorean photo album would be complete without one. 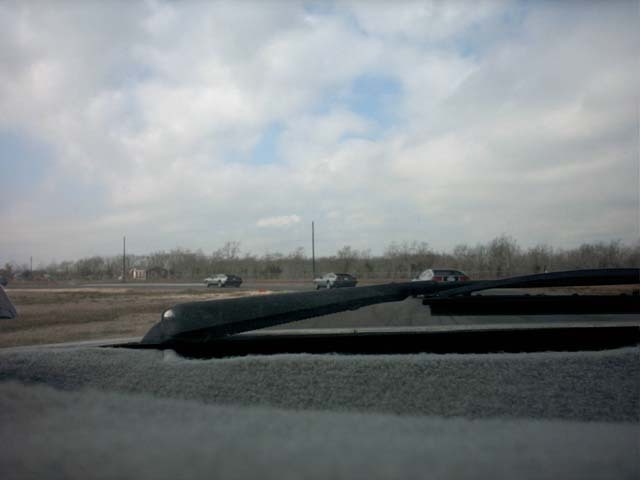 #3, If you look closely, you can see there is a dog inside Shannon's car. Would that be Einstein? #4, Another view of the show, on the grounds beneath the steple of the Metropolitan Church. Every year on a Saturday close to Halloween, the Niftee50ees group puts on this show. 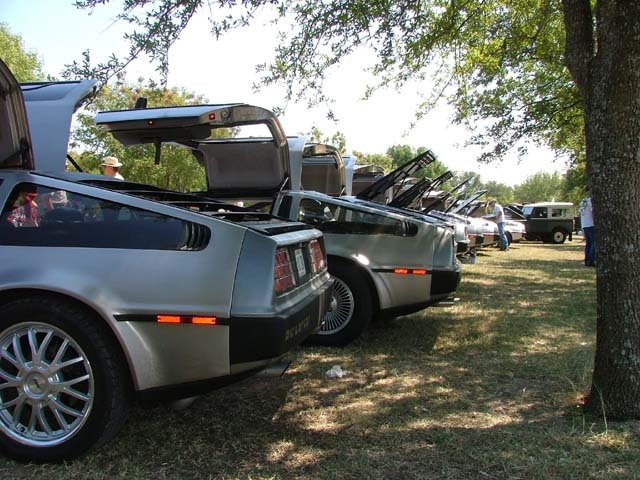 It is always highly attended and it is customary for the DeLorean club to attend. 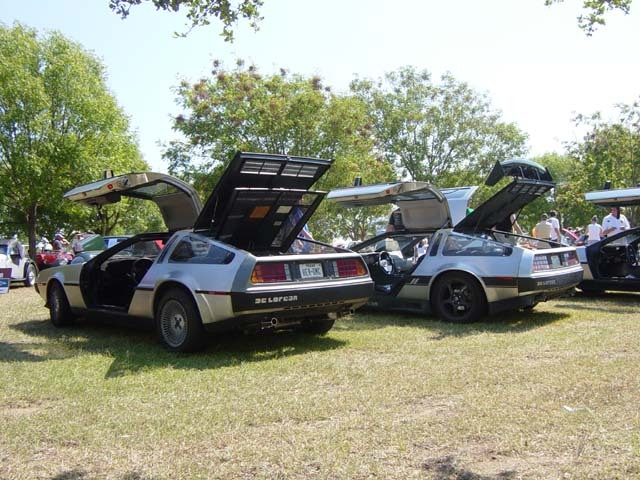 This year, eight DeLoreans attended (Ballard, Bharwani, Birdwell, Dietrich, Malbec, Mims, A. Owen, H. Owen). 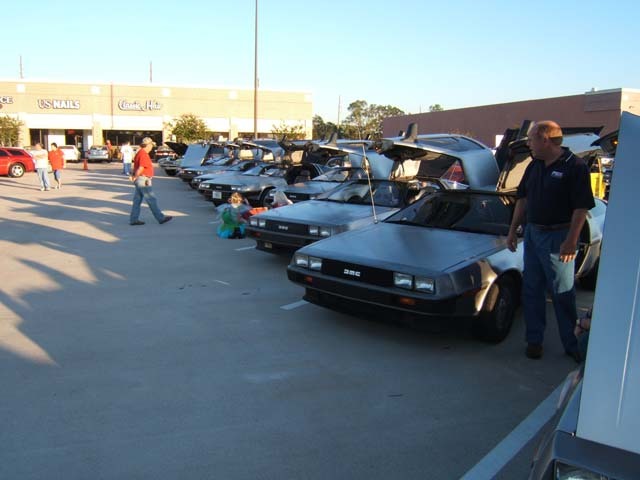 #1, DeLorean club members arived early because this is a very popular event, and for a club to park together they must secure their place before the show begins. 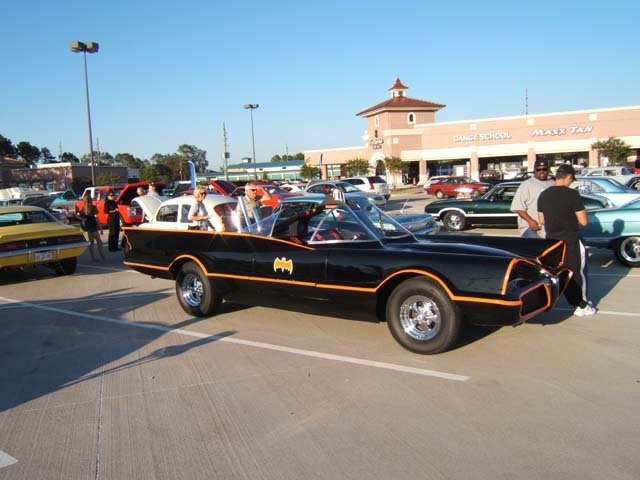 #2, The Batmobile made an apperance at the Halloween show. 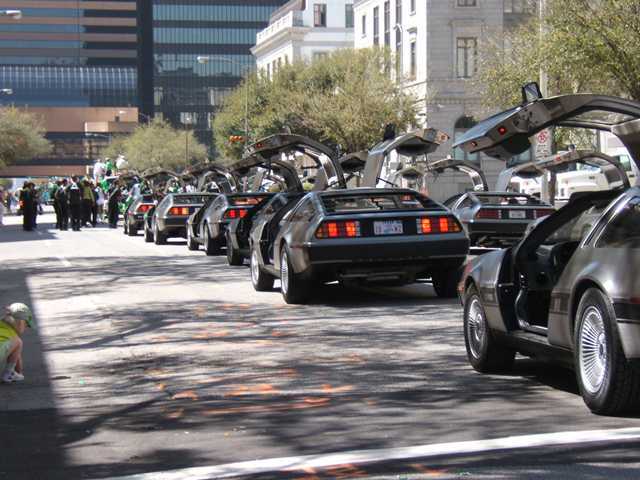 #3, During the show, the line of eight DeLoreans. #4, Group photo. 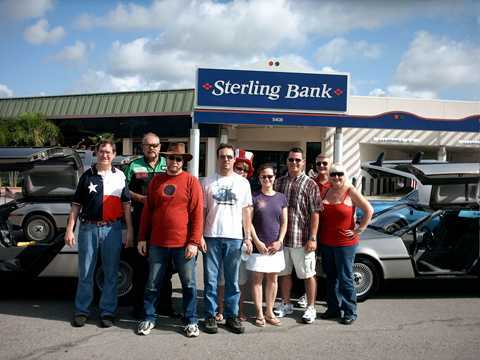 Left to right: Amy and Kevin Dietrich, Owen Malbec, Brandon Mims, Antje Owen, Bill & Rose Ballard, Heath Owen, Shannon Birdwell and Ali Bharwani.